Will there be children in your group? We can accommodate children as young as 5 years old. Are most people beginners or experienced rafters? We offer trips on beginner, intermediate, and advanced rivers. Can everyone swim? For the safety of our guests, all participants should be able to swim and feel comfortable in the water. 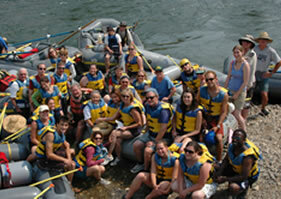 We offer Express, 1-Day, 2-Day, and 3-Day rafting trips on most rivers. We offer rafting trips on rivers all over California, many of which are located within close proximity to the San Francisco Bay Area and Sacramento. Booking at least 6 people on your trip qualifies you for great group Discounts. For groups of 24 or more, you can save big money on your own private trip with our Private Charter Trip option. If you're stumped about where to start, we suggest you consider an American River rafting trip. These rivers offer equal amounts of exciting whitewater and time to relax with your family. If you don't find what you're looking for there, you can check the other seven California Rivers we run.